Varsity Scoring Tables come in all sizes and forms to fit the need of your school or organization. Explore all our options below then check out our gallery or get a custom quote! All Scoring Tables come padded in the color of your choice and sport non-marking wheels to protect your gymnasium floor. Varsity Scoring Tables is proud to feature our unique integrated possession and bonus indicator system seen in action here. This Table can be ordered with or without a possession Panel. Many Schools have ordered a set of 64″ tables without the Possession Panel and placed them on either side of their 8, 10, or 12 foot Tables to increase seating capacity. This table has one backlit advertising panel that measures 52.75”x23.75” when ordered with the possession panel, and 64.75”x23.75” without the possession panel installed. The 8 Foot Freestanding Scoring Table is the perfect entry level size for Small and Medium sized Schools. This Scoring Table includes the Electronic Possession/Bonus Indicator panel. There are two backlit panels to place your School Name and Mascot or the Sponsors Advertising. The two backlit panels each measure 40.75”x23.75”. The 8 foot Scoring Table will comfortably seat 4 people. The 10 Foot Freestanding Scoring Table is perfect for the medium sized school. This Scoring Table includes the Electronic Possession/Bonus Indicator panel. There are two backlit panels to place your School Name and Mascot, or the Sponsors Advertising. The two backlit panels each measure 52.75”x23.75”. The 10 foot Scoring Table will comfortably seat 5 people. The 12 Foot Freestanding Scoring Table is Collegiate level and very popular with Medium and Large Schools. This Scoring Table includes the Electronic possession/Bonus Indicator panel. 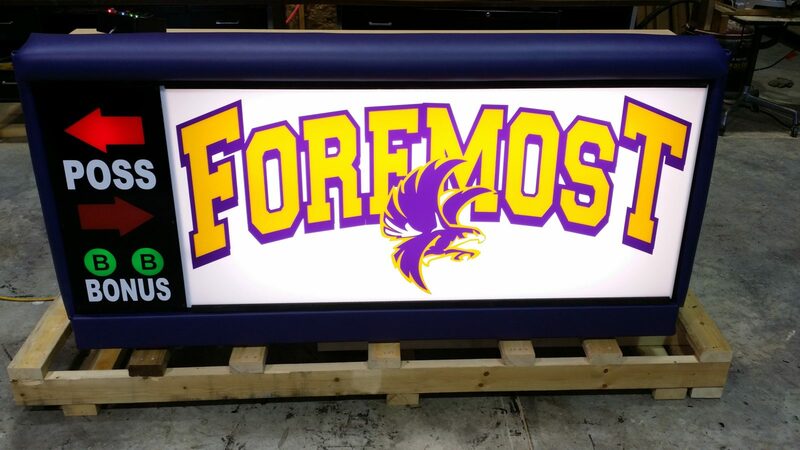 There are two backlit panels to place your School Name and Mascot or your Sponsors Advertising. The two backlit panels each measure 64.75”x23.75”. The 12 foot Scoring Table will comfortably seat 6 people. Bleacher Models are taller and pull into the bleachers allowing bleacher seating. 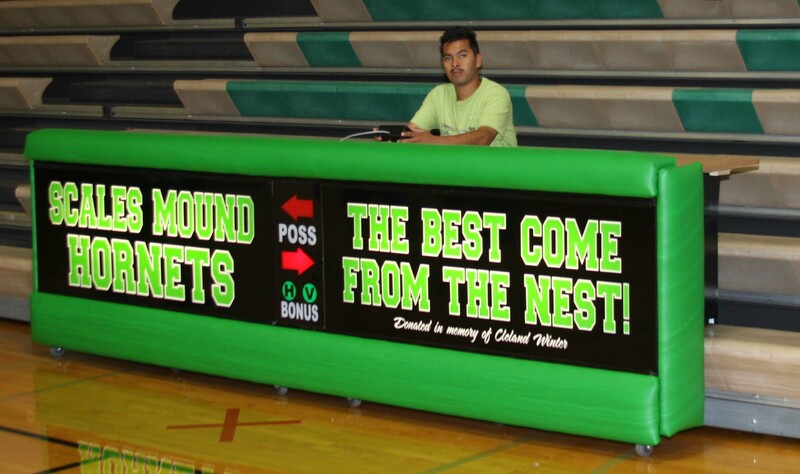 The 8 Foot Bleacher Scoring Table is the perfect entry level size for Small and Medium sized Schools. This Scoring Table includes the Electronic Possession/Bonus Indicator panel. There are two backlit panels to place your School Name and Mascot, or the Sponsors Advertising. The two backlit panels each measure 40.75”x23.75”. The 8 foot Table will comfortably seat 4 people. Bleacher Models are taller and pull into the Bleachers allowing bleacher seating. The 10 Foot Bleacher Scoring Table is perfect for the Medium sized School. This Scoring Table includes the Electronic Possession/Bonus Indicator panel. There are two backlit panels to place your School Name and Mascot or the Sponsors Advertising. The two backlit panels each measure 52.75”x23.75”. The 10 foot Scoring Table will comfortably seat 5 people. Bleacher Models are taller and pull into the Bleachers allowing bleacher seating. 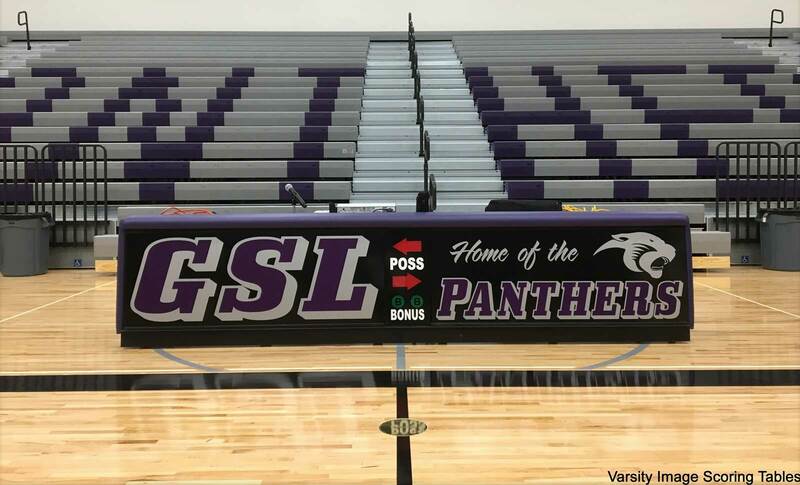 The 12 Foot Bleacher Scoring Table is Collegiate level and very popular with Medium and Large Schools. This Scoring Table includes the Electronic possession/Bonus Indicator panel. There are two backlit panels to place your School Name and Mascot or your Sponsors Advertising. The two backlit panels each measure 64.75”x23.75”. The 12 foot Table will comfortably seat 6 people.